One of the many recent trends in the film industry is dusting off classic fairy tales, polishing them up and presenting them in slightly-tweaked versions for young audiences who may be more attuned to stories of superheroes and robots than classic fables from the Brothers Grimm or Mother Goose. 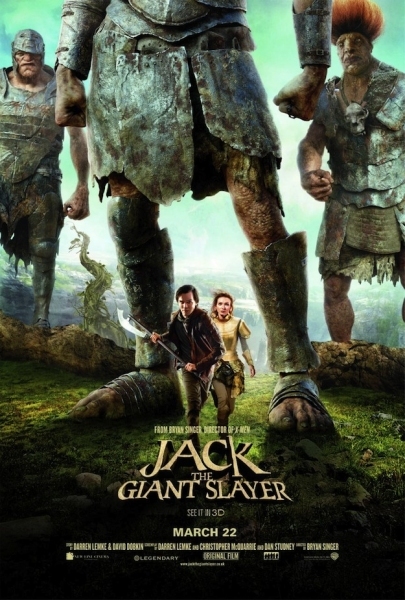 Within that trend, Jack the Giant Slayer, an epic retelling of Jack and the Beanstalk, is a bit of an oddity. In a strange paradox, it’s unique in that it’s so traditional. It’s also a change for director Bryan Singer, who takes a break from brooding stories of criminals, Nazis and dour superheroes for the surprisingly slight and sincere exploits of good-natured Jack (Nicholas Hoult), a young peasant who was raised on fairy tales about the ancient war between giants and humanity but has come of age in a mundane world of everyday medieval troubles. His attempts to sell his uncle’s pack horse to keep their farm afloat leave him with nothing but a handful of beans courtesy of a monk who warns him to never to get them wet. He does, of course, and at the worst possible time: on the same night that princess Isabelle (Eleanor Tomlinson), who dutifully follows fairy tale convention in her desire to escape an arranged marriage, happens to visit Jack’s little cottage. Before long, both cottage and princess are at the top of a tremendous beanstalk leading to the realm of the giants and Jack is volunteering to join the realm’s bravest knight (Ewan McGregor) and Isabelle‘s scheming fiancée (Stanley Tucci) to rescue her. Meanwhile the giants, led by the vengeful General Fallon (voiced by Bill Nighy), see the beanstalk as their opportunity to invade. It seems appropriate that the film opens with two children being told a simple bedtime story since that seems to be exactly what Singer has set out to do here. He brings the fairy tale back to its basic elements, eschewing the self-referential humor of Shrek or the gothic horror elements of Snow White and the Huntsman to present a refreshingly faithful take on the original folktale, in spirit at least if not plot. The film manages to be playful yet is never outright funny, with several bits of dialogue delivered as though they are the set-up for punchlines that don’t come. Meanwhile scenes of the giants gleefully gulping down characters just offscreen and the use of human bones in their architecture and costuming provide that element of the macabre that a good fairy tale needs. This fun/scary tone is captured well in the film’s best set piece, as Jack braves the giants’ kitchen to try to keep his friends off the menu. However, this stylistic decision also means that in place of characters, we get archetypes: the love-struck farm-boy, the restless princess, the brave knight, etc. We never find out more about anyone than what is needed to move the story forward, leaving it insubstantial to the point of being disposable. My film-going companion and I found we had trouble remembering the fate of one particular character before the film’s credits had even finished. This lack of texture extends to the disgustingly uncouth giants as well, who are defined less by personality than by decent visual effects that only occasionally totter into the uncanny valley. The most interesting among them ends up being Fallon’s parasitic twin brother, a cackling Gollum-like head sprouting from his shoulder. Despite having little in the way of characters to play, the actors mostly seem game. Tomlinson and Hoult are pleasant and earnest as the young heroes. McGregor, stuck with a particularly thin role and a really strange hairstyle, succeeds mostly based on his undeniable charm. Does this man ever age? There’s a nice supporting cast as well, with Ian McShane getting to play a good guy for once as Tomlinson’s kindly but rigid royal father, Tucci hamming it up as one of the film’s villains (which I assure you is not a spoiler), and a brief appearance by Willow himself, Warwick Davis. I only wish Ewen Bremner, who plays Tucci’s dastardly toadie, got a longer scene with McGregor. It would have been a bit of a thrill seeing Mark Renton and Spud reunited. Jack’s adventures may not translate into the kind of hit-all-quadrants blockbuster the allegedly sizeable budget was spent to produce but they should appeal well to kids deprived of old-fashioned storytelling or adults seeking a few hours of harmless escape. In fact, the simplistic characterization of Jack becomes nicely emblematic of the whole movie: not particularly witty or deep, but amiable enough, eager to please, and has his heart in the right place. For what the movie's worth, the movie has cool action, visuals, and a fun feel that hardly ever goes away. Good review Tim.